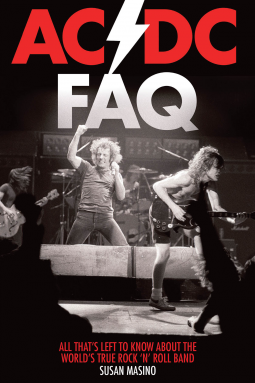 Publisher Description: Featuring 37 chapters, AC/DC FAQ chronicles the personal history of each of the band members, all their albums, tours, and various anecdotes. Rebounding from the tragic loss of their singer Bon Scott in 1980, AC/DC hired Brian Johnson and went on to record Back in Black, which is now one of the top five biggest-selling albums in music history. Review: Kind of a synopsis of the bands coming together from the personal backgrounds up to the band inception. Written anecdotally, almost like the band didn’t proof or verify much of what was written. At one point the name of the band comes up where either there sister got it from the back of her sewing machine while making Angus his outfits and another from someone else getting it off a vacuum cleaner. Either way, if you are doing a biography you should be able to verify the facts that your pre-supposing?? The writing style is flat and often reaches the mundane when the author ascribes herself a personal affinity with band members as the photos attest to. Good biographies are written strictly about the band and authors egos should take a back seat when writing about them. This is really a one star work but gets another just for Angus.